Difference between revisions of "Theater View"
Theater View is MC's interface for use from across the room. It's well suited for installs where a TV is used for the display. 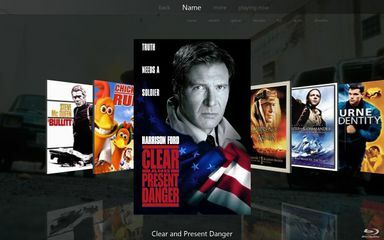 It works well with JRiver's [[Media Center Remote]], with [[JRemote]] for iOS and Android, or with [[Gizmo]] for Android. This wiki page references options available within 'Tools' -> 'Options' -> 'Theater View' [updated for MC15]. *'''Allow special handling on media insertion''': With this setting ticked, DVD and Blu-ray discs will be automatically played on insertion even if Autoplay is turned off in Windows and MC. CDs will not be Autoplayed. This is a legacy setting, introduced in 2009, and appears to have been most useful when an external optical disc player such as TMT or PowerDVD was used with MC. It may be best to leave this turned off and use the MC and Windows Autoplay settings instead, or just play the disc once it has been detected by MC, and is ready to play. Click on "Click to see Instructions..." button in the options section for more info. See the [[Theater View Television Guide Setup]] guide for details. Theater View is MC's interface for use from across the room. It's well suited for installs where a TV is used for the display. It works well with JRiver's Media Center Remote, with JRemote for iOS and Android, or with Gizmo for Android. Theater View also works well for touch screen computers. Skin: Select the skin to be used in Theater View. This is where you can select a touchscreen skin, making Theater View compatible with your touchscreen computer. 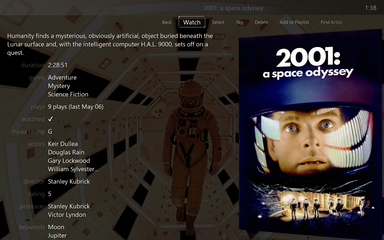 Size: Select the size of the Theater View lists and icons. The default is "100%". Drawing Quality: Default is "Medium Quality"
Jump on play: None, Playing Now or Full Screen: This determines what Theater View displays when you play something. If you tend to watch video or images, you may want to set it to Full Screen. 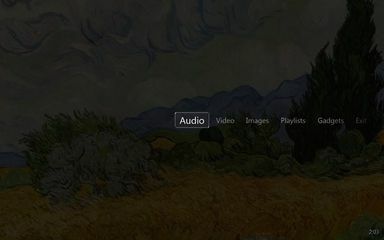 Play sound: When enabled, Media Center plays a sound when Theater View menu items are selected. Allow special handling on media insertion: With this setting ticked, DVD and Blu-ray discs will be automatically played on insertion even if Autoplay is turned off in Windows and MC. CDs will not be Autoplayed. This is a legacy setting, introduced in 2009, and appears to have been most useful when an external optical disc player such as TMT or PowerDVD was used with MC. It may be best to leave this turned off and use the MC and Windows Autoplay settings instead, or just play the disc once it has been detected by MC, and is ready to play. 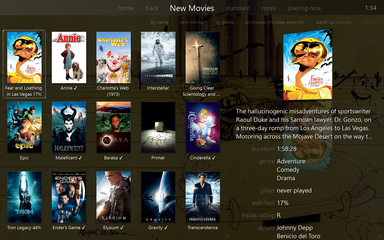 There are the menu items throughout the Theater View interface. You can Add, Edit, Remove, Nest, and Sort them using the tree and commands found in the lower half of the Theater View Options. See the Theater View Television Guide Setup guide for details. In order to create a more usable theater setup on a Home Theater PC (HTPC), it is important to understand the keyboard shortcuts that are available. This allows infrared or RF remotes to be programmed to control a variety of features in Media Center's theater view. Arrows. The four arrows are used for navigating the elements presented by theater view. Enter. Selects an item which is highlighted to expand its properties. Ctrl + p. Plays and pauses video. Ctrl + n. Next track or chapter in DVD. Ctrl + l. Previous track or chatper in DVD. i. Zooms in on video at about a percent each button press. o. Zooms out on video at about a percent each button press. a. Cycles between various aspect ratios to help stretch or zoom a picture to better fit the display. Backspace. Travels back one page and can eventually return users to the home page. Page up / Page down. Travels one full page up or down to help expedite scrolling. Ctrl + -> / Ctrl + <-. Fast forwards or rewinds video at 5x, 20x, and 100x with incredibly good quality on DVD video content. Home / End. Jumps to the top or bottom of a list. Esc. Starts the exit process from theater view. Users must then select Yes to confirm exiting. This page was last modified on 24 September 2018, at 19:54.